Build a data set and find the mean, median, and mode. Explore the mean, median, and mode illustrated as frogs on a seesaw, frogs on a scale, and as frogs stacked under a bar of variable height. Lesson to reinforce how to define these measures of central tendency in data sets. This is the assessment for the mean, median and mode for the French immersion classrooms. Making notes on central tendencies with screenshots. Problems to reverse engineering datasets given cent... (more)ral tendency criteria. This lesson has been simplified to focus solely on mean and incorporate some writing into the assignment.... (more) I felt it might complicate things for students who are struggling with the concepts to put all three into one assignment. My students think this is a game! We love it! This gizmo is great for helping students understand the difference between mean, median and mode. 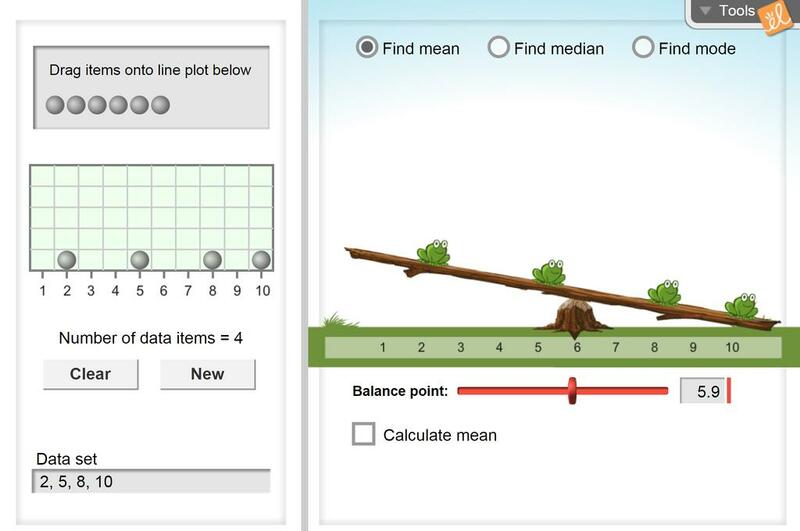 An excellent tool to demonstrate how to calculate mean, median, and mode! Shows differences between mean, median, and mode. Visually appealing Gizmo.